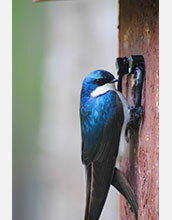 A tree swallow returns to its nest box to incubate eggs. Researchers surrounded the nest�s opening with an antenna that was coupled with a tracking tag on the bird. Using this design on each nest box and bird, researchers recorded more than 177,000 feeding visits for 63 females in 2015. 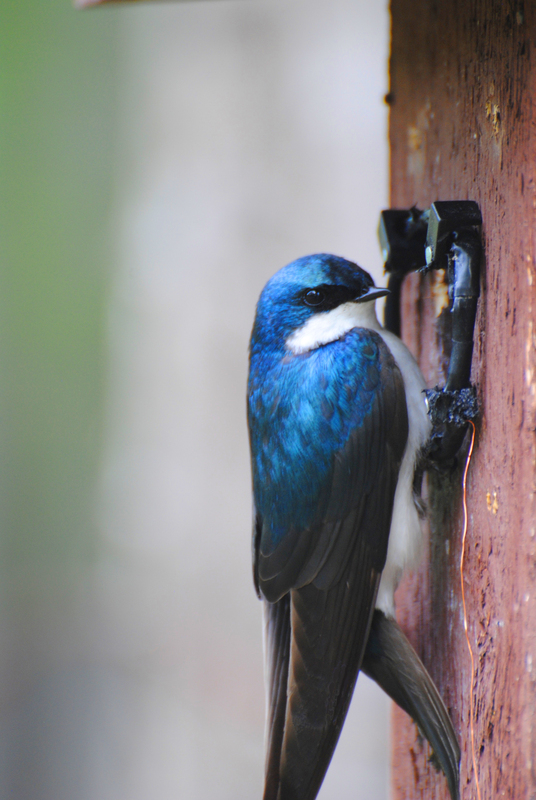 Two recent studies of tree swallows use an innovative study design to uncover long-term consequences of passing but major stressful events. Both studies provide information on how major stressful events have lasting effects and why some individuals are more susceptible to those impacts than others. In the first study, researchers developed a new method for manipulating hormone levels in free-living birds. They dissolved a stress hormone (glucocorticoid) in a gel and put it on eggs in tree swallow nests. The females -- the only ones who incubate -- absorbed the hormone through their skin. They were given five separate doses for an hour each early in their reproductive periods. After absorbing the hormone, females fed their offspring at lower rates once they hatched, which led to much smaller offspring compared to two types of controls (one type with gel but no hormone on an egg and the other undisturbed). The smaller offspring in turn had lower survival rates. "The take-home message here," said Maren Vitousek, assistant professor in the Department of Ecology and Evolutionary Biology at Cornell University, "is that the hormones that birds would be exposed to if they had a short-term stressor do have these long-term effects." The researchers also found that birds exposed to higher doses of glucocorticoid were more likely to endure lingering impacts. This result suggests that individuals who naturally mount a stronger hormonal response to brief challenges may be at greater risk of suffering from lingering effects of stress, Vitousek said. For the second study, which examined conditions that predict susceptibility to stress and why some individuals cope with stress better than others, the researchers captured birds and measured baseline stress hormone levels; how high they increased from the stress of capture; and how quickly they returned to normal levels. The birds were then released and exposed to glucocorticoid on eggs, using the same protocol as the previous study. After these birds absorbed the hormone, the researchers measured how fast they recovered to their baseline hormone levels. There was a lot of variation among the birds but a pattern revealed birds that were better able to turn off that initial stress response to capture also returned to baseline levels faster, following glucocorticoid exposure. "Individuals that are more naturally stress resilient are those that are better able to turn off this response to begin with," Vitousek said.